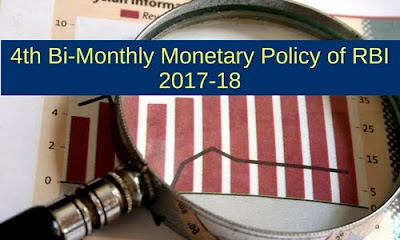 On October 4, 2017, Reserve Bank of India (RBI) announced Fourth Bi-Monthly Monetary Policy Statement in which the Policy Repo Rate has been kept unchanged for financial year 2017-18. RBI but cut the statutory liquidity ratio (SLR) by 50 basis points to 19.5 per cent but kept the repo rate unchanged at 6 per cent. The Monetary Policy Committee (MPC) decided to Keep the rates unchanged the policy repo rate under the liquidity adjustment facility (LAF) at 6.0 per cent, the Reverse Repo Rate at 5.75 per cent, the Bank Rate at 6.25 per cent and marginal standing facility (MSF) rate remains the same except Statutory Liquidity Ratio (SLR). Statutory Liquidity Ratio (SLR) has been cut by 50 basis points to 19.50 per cent, which will effect from October 14, 2017. Economic growth forecast has been revised down to 6.7 per cent from the August 2017 projection of 7.3 per cent for FY 18 also projected inflation to stay in the range of 4.2-4.6 per cent in the second half of 2017-18. RBI continues to work towards the resolution of stressed corporate exposures in bank balance sheets. Primary reasons for downward revision of growth forecast are Loss of growth momentum in Q1 of 2017-18, adverse impact on the manufacturing sector owing to uncertainties triggered by Goods & Services Tax (GST) implementation as per the MPC. On 5th and 6th December 2017 the Next meeting of RBI Monetary Policy Committee is scheduled.